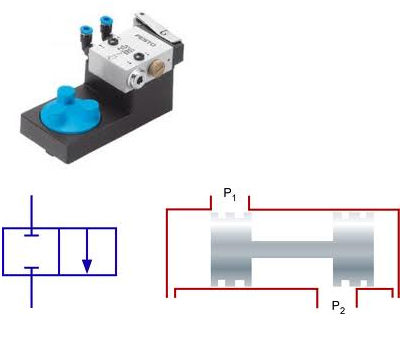 In this tutorial of pneumatics we shall deal with different types of pneumatic pistons, solenoid valves, their nomenclature and a basic introduction to symbols of various components which we would use in a software for pneumatics simulations called FLUIDSIM. So let’s start with the different types of pistons, their applications and working. Telescopic cylinders incorporate a piston which is nested with a number of hollow segments of increasing diameter. This kind of piston allows for a longer stroke than the normal single acting cylinder but its piston can be easily flexed due to its segmented design. Therefore it is use in areas which have low side load. An application for telescopic cylinders commonly seen is that of the dump body on a dump truck used in a construction site. In order to empty the load of gravel completely, the dump body must be raised to an angle of about 60 degrees. To accomplish this long travel with a conventional hydraulic cylinder is very difficult considering that the collapsed length of a single stage rod cylinder. Task is easily accomplished, however, using a telescopic style multi-stage cylinder. Packer-ejector cylinders in garbage trucks and transfer trailers, horizontal compactors, telescopic excavator shovels, and roll-on/roll-off trucks. 4. Through rod air cylinders: piston rod extends through both sides of the cylinder, allowing for equal forces and speeds on either side. This type of actuators are used where we require actuation in both the directions one after the other. 5. 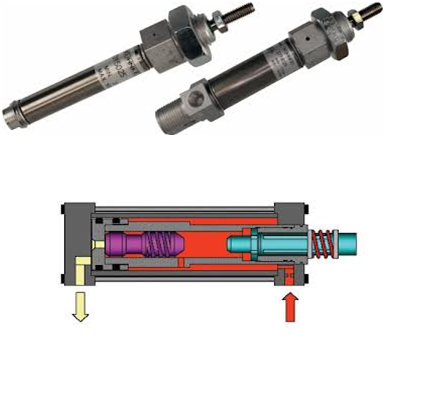 Cushion end air cylinders: cylinders with regulated air exhaust to avoid impacts between the piston rod and the cylinder end cover. This kind of pistons are used where sudden jerks need to be avoided. This type of actuators are used to operate pipeline and process valves in the petrochemical industry. 7. Rodless air cylinders: It does not have a piston rod. It contains actuators that use a mechanical or magnetic coupling to impart force, to a body that moves along the length of the cylinder body, but does not extend beyond it. 8. 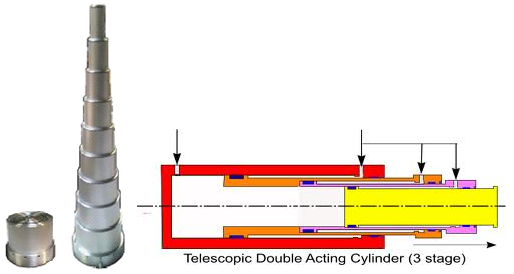 Tandem air cylinder: It is a combination of two cylinders in series to increase the force output. They can provide constant speed at low velocities. 9. Impact air cylinder: These are high velocity pistons to withstand the impact of the retractingpiston rod force. Used in applications where piston need to work at high velocity. Before we start discussing about the different types of valves we must know how to differently identify and name each of them. The spool (sliding type) consists of lands and grooves.The lands block air flow through the valve body. The grooves allow gas to flow around the spool and through the valve body. 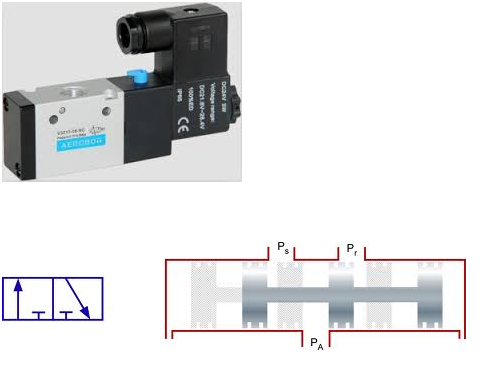 There are two fundamental positions of directional control valve namely normal position where valve returns on removal of actuating force and other is working position which is position of a valve when actuating force is applied. There is another class of valves with 3 or more position that can be spring centered with 2 working position and a normal position. Example: A 5/2 directional control valve would have five ports and two spool positions. According to total number of entries or exits connected to the valve through which fluid can enter the valve or leave the valve there are types like two way, threeway, four way valves. Including the normal and working positions which a valve spool can take there are types like two position, three position and proportional valves. 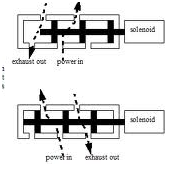 Solenoid valves contain a solenoid inside it, as the name suggests. Its structure is such that it contains columns in which air can be trapped. When the electrical or manual input is given, the air column shifts from one side to other as is illustrated by the diagram below. Valves are specified using the number of ports and the number of switching positions. It can be represented in general form as np/ns, where np is the number of ports connected to the direction control valve and ns the number of switching positions. Therefore with same example i.e. is 5/2 valve, 5 is the number of ports and 2 is the number of switching positions. In a direct-acting solenoid valve, a coil magnetically opens the valve in a direct action, lifting the shaft and the seat of the valve without depending on outside pressure. In pilot-operated valves, the plunger opens up the pilot opening while built-up pressure causes the valve to open and close. The two ports are used to permit and restrict flow alternatively. Thevalve can be specified to be either “Normally Open” or “Normally Closed” in its operation. With a normally open/close valve, the valve remains open/close until some type of current is applied to close/open the valve respectively. Suspension of the electrical power causes the valve to automatically re-open to its normal state. Three way valves come with three ports. Three way valves are used when alternate pressure and exhaustive pressure are required for operation, such as in a coffee machine or dishwasher. These valves can have four or more port connections. Four way valves are used with a double acting cylinder or actuator. Half of the port connections provide pressure, as the remaining ports take out exhaust pressure. You can specify these valves to be either normally closed, normally open or universal. It’s actually a cool and helpful piece of information. I am happy that you simply shared this helpful information with us. What are you searching for?? If you are interested in any topic, tell us and we will include it in the next blog at http://www.rignitc.com. I’m just commenting to let you understand of the helpful encounter our daughter went through using the blog. She picked up such a lot of pieces, which included what it’s like to have an ideal teaching mindset to make folks effortlessly understand several problematic things. You actually did more than people’s desires. Many thanks for rendering these helpful, dependable, educational and even cool tips about this topic to Janet. What’s up, I read your blogs on a regular basis. Your story-telling style is awesome, keep up the good work! What’s up to every , since I am really keen of reading this website’s post to be updated regularly. I simply want to say I am just newbie to blogs and really enjoyed this web-site. Almost certainly I’m going to bookmark your website . You certainly come with awesome article content. Thanks a lot for revealing your website page. to pay a quick visit this site, it contains important Information.